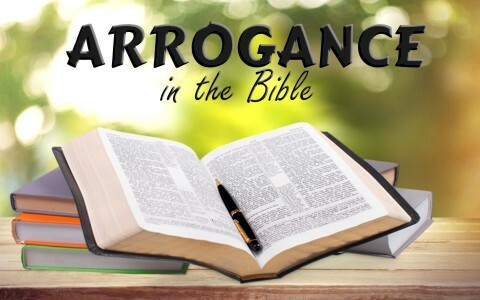 The concept of arrogance is not a new thing, just as Solomon wrote so many years ago “The thing that hath been, it is that which shall be; and that which is done is that which shall be done: and there is no new thing under the sun” (Eccl. 1:9). We can find a definition of arrogant as: “making claims or pretensions to superior importance or rights; overbearingly assuming; insolently proud” (1). And this word can be substituted by words such as: presumptuous, haughty (proud), imperious, conceited and vain. Some might even agree that another synonym for arrogance is narcissism. That being said, what does the Bible say about arrogance? Number one on that list of seven things that are an abomination to the Lord – a proud look. No mistake there. God has given us some guidelines to follow when it comes to our behavior and the Bible is not silent about what the Lord hates. Everything we say and do should be something that we do out of our love for God or our love for our neighbor. When it is not, dollars to donuts you might be doing one of those seven things that the Lord hates, and it all starts with a proud look. “The fear of the LORD” is another way of saying, when we respect the Lord we will hate what he hates. The Lord hates “a proud look” (as mentioned above). This verse from Proverbs further defines that “proud look” as arrogancy. It even goes so far to say that arrogancy and pride are the “evil way”. And then there is that little phrase “the froward mouth”. That Old English word has been lost in today’s language. Someone who has a froward mouth is someone who is not easy to get along with, everywhere they go, they stir up contention. Don’t we see that in an arrogant person too? They know it all and heaven help the one who tries to disagree with him. While we hate the arrogance we must find a way to approach the arrogant Christian with meekness to gently point out the fault in this behavior (Gal 6:1-5). No man knows it all because man is not omniscient as God. Romans 12:3-5 For I say, through the grace given unto me, to every man that is among you, not to think of himself more highly than he ought to think; but to think soberly, according as God hath dealt to every man the measure of faith. For as we have many members in one body, and all members have not the same office: So we, being many, are one body in Christ, and every one members one of another. It’s not about you! Remember when the lawyer tried to trip Jesus up by asking Him which was the greatest commandment? Jesus responded this way: “Jesus said unto him, Thou shalt love the Lord thy God with all thy heart, and with all thy soul, and with all thy mind. This is the first and great commandment. And the second is like unto it, Thou shalt love thy neighbour as thyself. On these two commandments hang all the law and the prophets” (Matt 22:37-40). There is no “I” or “me” in those commandments. As I mentioned earlier, the things that you do on earth should be motivated by your love for God or your love for your neighbor. If not, you are being selfish. It is essential that we get outside of ourselves and do what we can for one another. We each have a part in the body (church) and when we don’t do our part because we are caught up in arrogance and selfish pride, the body is not healthy and begins to deteriorate. God has blessed us with gifts and talents, do you remember to give Him the glory for it? When you have sung a beautiful song in church and someone compliments you for it do you remember to say “Praise the Lord; He gave me my voice”? Or how about when you scored a great grade in one of your school subjects, do you remember to raise a little prayer “Praise the Lord”!? Everything we have, our voice, talent, possessions and even our intellect comes from God. Remember to thank Him for it and to never take it for granted. Arrogance and pride are found in the hearts of many, but there is no room for this in the family of God. God hates a proud look and as Christians we should hate what God hates. Don’t be deceived into believing arrogance is wisdom and don’t mistake boldness for arrogance either. And remember it is not all about you, we are called to edify others greater than ourselves (Phil 2:2-4). Finally, be sure to remember to give God the glory for all that He has done and continues to do for you. Here is a related article for you: What Does the Bible Say About Pride?